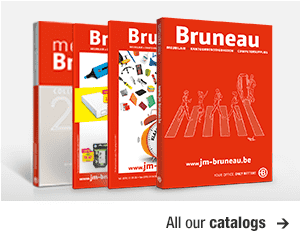 Bruneau is the source for all your office supplies and office furniture. We deliver to all companies, professionals and independent entrepreneurs only. In our web shop, you'll find more than 30.000 office products at very competitive prices, which you can order online, by phone or by fax. All prices are excluding VAT. Our products come with at least a 2 year warranty, and you can send them back within 30 days if you are not satisfied. We offer free, complimentary delivery within 24 hours for orders starting from €74 if your order is confirmed before 4 pm. Bruneau offers you a vast range of office furniture. We have dozens of different models, all available in various colours and materials, in order to meet your personal needs. In this assortment, you will have an extended choice between different types of office desks : going from low-priced desks, to designer desks and management desks, or the combination of all these different models. Your own personal taste helps us to determine which would be the perfect combination, based on the various given demands for proper usage. To complete even more our large assortiment of office furniture, we sell not only desks, but we also give you an extended offer of office chairs : classic chairs, « budget »chairs, ergonomic office chairs, meeting and reception chairs, canteen chairs, etc. In order to fill the gaps in the complete assortment, we have also added a large amount of cabinets (drawer cabinets, cupboards with folding doors, filing cabinets etc. ), available in every measure and weight. At Bruneau, the final aim is to satisfay the customer in every possible way : a delivery of more than 1 400 office desks just in 24 hours, free samples, quotations and advice for your own office furnishing, a profesional team of mechanics, a guarantee of at least 2 years and a profesional after sales service.